Description: A majestic Moose meanders alongside a mountain lake as the brilliant morning sun rises at dawn, making an image that is perfect for picture postcards and great works of art. Eye-catching Sunburst Opal art glass depicts the sky as Blue-Green Ripple art glass represents the water. This sconce features decorative accents and hardware in a Craftsman Brown finish. 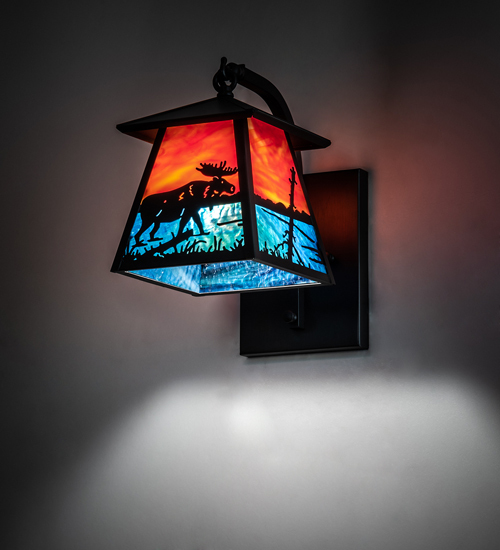 This fixture is custom crafted by highly skilled artisans at the foothills of the spectacular Adirondack Mountains in Upstate New York. Custom sizes, styles and colors are available, as well as dimmable, energy efficient lamping options such as LED. The 6-inch wide sconce is UL and cUL listed for dry and damp locations.